For the manager of the largest exchange-traded fund backed by the metal, not even a surprise increase in U.S. borrowing costs this month would be enough to damp investor appetite for gold. “We’re still going to be in an environment where rates in the U.S. are still very low,” David Mazza, the head of ETF and mutual-fund research at State Street Global Advisors, which manages SPDR ETFs, said in an interview Friday at Bloomberg headquarters in New York. Holdings in gold-backed ETFs are heading for a third quarterly gain, the longest streak since 2012, even as the odds of a rate increase in September rise, data compiled by Bloomberg show. 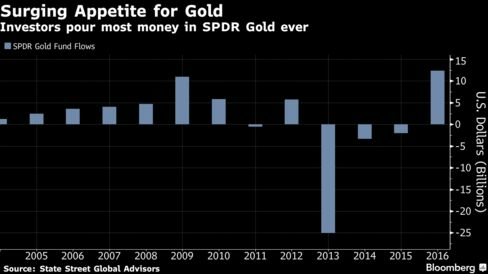 Investors have already poured $11.93 billion into SPDR Gold Shares this year, the biggest inflow among more than 7,000 ETFs tracked by Bloomberg. Gold has rallied 25 percent this year, poised for the biggest annual gain since 2010, just a year before prices surged to a record. Money poured back in after three straight years of losses, as the Fed held off raising rates, while accommodative monetary policies from Japan to Europe helped push some bond yields below zero. Lower borrowing costs boost the investment appeal of commodities, which don’t offer yields or dividends. Most traders appear unconvinced that the economic data would warrant a move soon, with the odds staying below 50 percent until December. The Institute for Supply Management’s services gauge fell to a six-year low in August. That came after the ISM factory survey showed contraction in manufacturing. Government data released Sept. 2 signaled cooling in hiring, while a private report showed consumer sentiment at a four-month low. ETFs backed by the precious metal account for just 3 percent of the $3.21 trillion of assets held by investors, signaling there’s “ample room” to add strategic gold allocations to their portfolio, and supporting the gold rally, UBS Group AG said in a report Aug. 16. Prices may rally to $1,500 an ounce as central banks delay rate hikes, Francisco Blanch, head of commodities research at Bank of America Merrill Lynch, said last month. December gold futures traded at $1,328.50 an ounce, down 0.4 percent at 9:15 a.m. on the Comex in New York. In the week ended Sept. 6, money managers boosted their net-long positions in gold futures and options by 17 percent, the most since June 14, government data show. The aggregate open interest in the precious metal soared 41 percent this year.